How many of us have had this conversation before? It is literally the MOST OFFENSIVE conversation someone can have with me. Yes, I get summers “off,” if by “off” you mean I don’t get a paycheck. But other than that, I’m spending a good bit of my time continuing to work. For most of us, summer is when we catch up on all our professional development that we don’t get to during the school year. I don’t mind professional development, actually. I like being with other teachers. They are a wealth of information and knowledge. When you inevitably break out into a PD small group session, start your group by collecting contact information from everyone who is in the group. Even if it is just a name and email address, this is a great opportunity to expand your teaching network to teachers at other schools and even other counties and states, depending on the PD you are attending. These contacts are really great to have during the middle of the school year when you are wondering what other teachers, schools, or districts are doing to handle a specific academic issue or challenge. As simple as this sounds, it can be extremely awkward to say, “Hey there, strange teacher friend, can I have your name and email address for my creeper files?” So, try something more casual and honest. Something like, “I know this is weird, but would you guys mind if we shared email addresses in case we have questions or follow up later about our session?” I promise you that at least one other teacher is wishing they had this information, too! Try creating a privacy setting for “Work” or “Professional,” which gives limited profile access to professional contacts. This way, you are still connected with someone, but they aren’t all up in your personal life. Seeing someone in your Facebook feed keeps them fresh in your mind and relevant in your professional network much longer than sitting in a three-day PD session with them. Often during summer PD, there is a mixed bag of attendees from your school. This is a great time to get to know teachers from other departments and grade levels from your school and administrators or teacher leaders. But here’s the real tip: Don’t badger them! Try to refrain from begging for tools and things you need for your classroom and don’t try to wiggle information out of them. This is not the time to be a teacher weasel, my friends. This is the time to get to know them and to let them get to know you. It’s also the time to step up and help them out. For example, if it comes out during your PD session that the school is short on a staff person to oversee an extra curricular or something similar, volunteer to help out. Make an impression as a problem solver and a helper. This is your chance to shine Building strong relationships with other peers and admin from your school during the summer can help make your school year so much smoother. Professional Development is a great place to learn more about aspects of your profession, but it is an even better place to build and grow your professional network. Don’t waste the opportunity to meet other teachers, grow your social media network, and to shine for your own administration. Make the most of your summer development while you’re there! 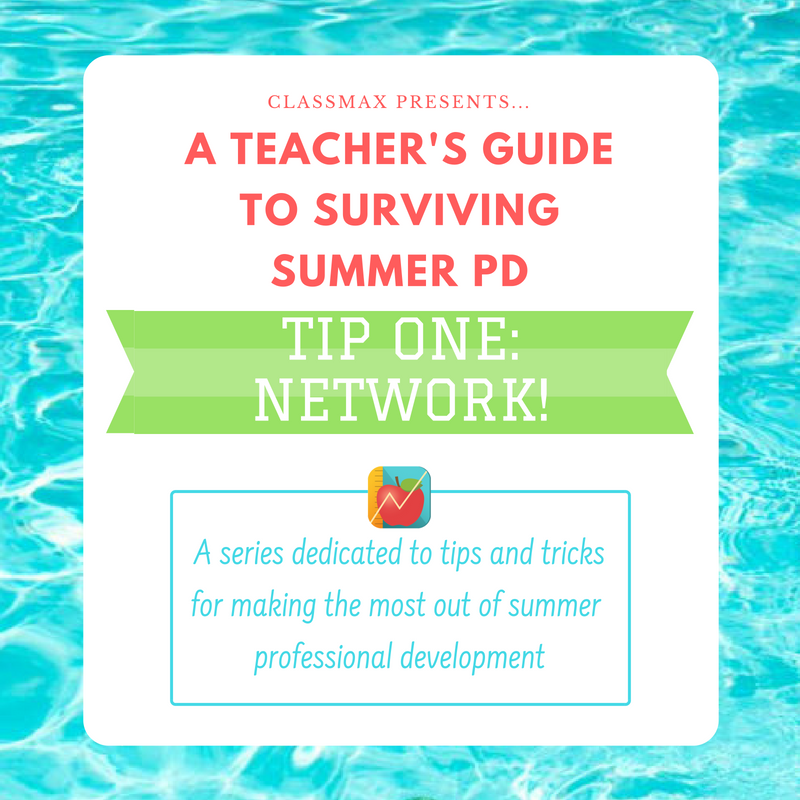 Join us tomorrow as we explore how to use your summer PD as a time to set up and personalize your ClassMax account. Also, be sure to take advantage of our summer sale going on right now! 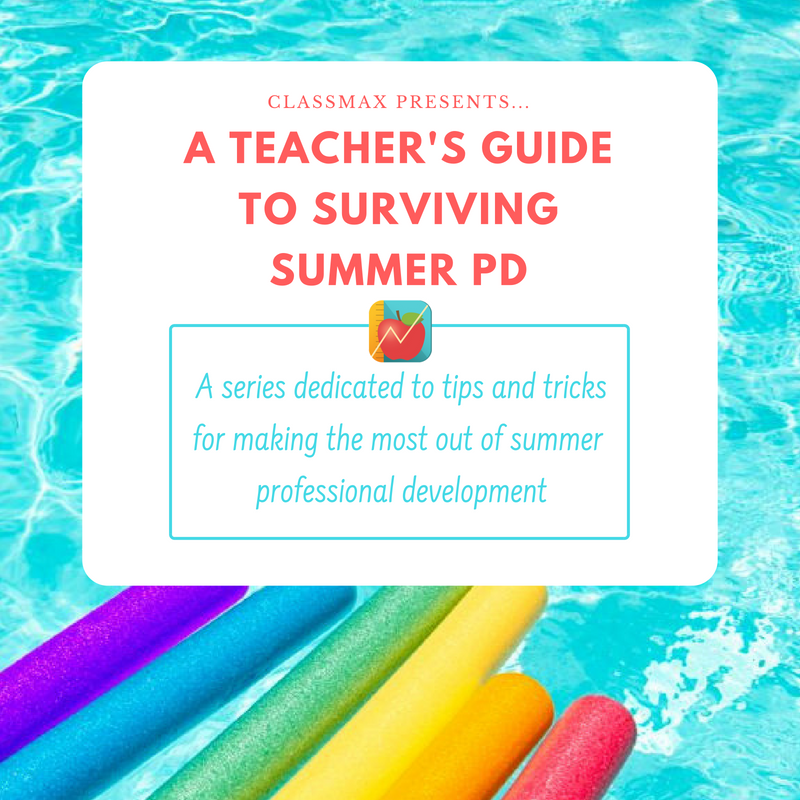 This entry was posted in A Teacher's Guide to Surviving Summer PD, Teacher Life and tagged teacher life.